Last week the world paused to remember a man who committed his life to serving those less fortunate and to inspiring others to greatness – Dr. Martin Luther King Jr. Each year, Emory University’s Rollins School of Public Health honors organizations who demonstrate true leadership in the community at its Dr. Martin Luther King Jr. Community Service Awards, and Café 458 was honored to be one of this year’s recipients! Atlanta Center for Self Sufficiency President Charles Edwards and ACSS’s Clinical Counselor Bobbie Slocumb attended a reception at Emory University last week where they accepted the award on behalf of our dedicated staff and volunteers. 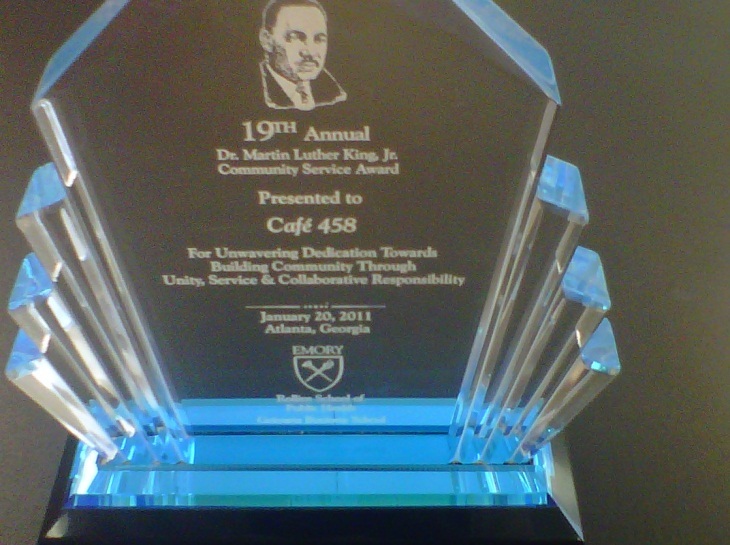 Here’s a picture of the award which is now proudly displayed in the Café 458 dining hall. Café 458 was nominated for the award by a volunteer who was impressed by Café 458’s programs and lunch service for Metro Atlanta’s homeless population. By providing daily meals, case management and support services, Café 458 helps our guests achieve personal goals. Staffed by ACSS employees and volunteers, everyone who works at Café 458 makes extra effort to ensure that the men and women we serve feel special and are treated with dignity as they continue to make strides towards recovery and self-sufficiency. Click here to read more about ACSS’s award-winning program.